We are so grateful to the 622 clients so far who have left reviews for us. 99% of our reviews have been positive, and of the tiny handful that haven’t been, generally it has been due to a minor misunderstanding that we’ve been able to sort out. We take a lot of pride in the great service we offer to tradies, so we’re very happy to share the wonderful reviews and ratings that many of our clients leave for us. We use an external provider to collect reviews and ratings from our clients. This helps to give prospective clients the confidence that all reviews are collected independently and cannot be altered by us. In 2017 (and again in 2018!) 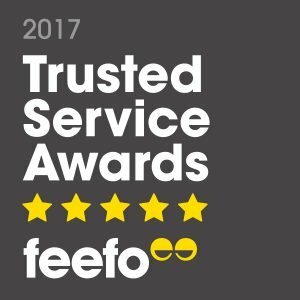 this culminated in Trade Risk being awarded a Gold Trusted Service Award from Feefo, which was great recognition for the fantastic service we provide to tradies. You can view all of our reviews below, or view them here on the official Feefo site. PS. The system will say we have around 200 reviews rather than 600. This is because it only shows figures for the last 12 months. If you go to our page on the Feefo site you’ll be able to see the full 600+.